Dexterous, versatile, and powerful, the only thing “mini” about this 64-pad Ableton controller is the size. 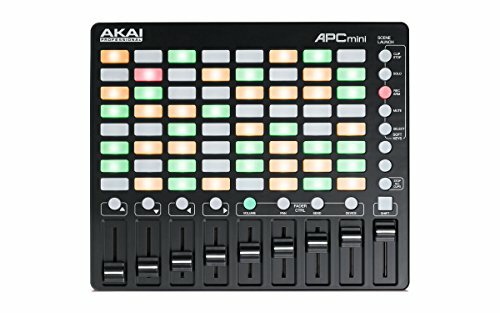 The Akai Professional APC mini is the most portable all-in-one Ableton controller solution with Akai Pro build quality. We engineered APC mini specifically for the mobile musician and the desktop producer, so it concentrates the essential features of the APC40 MKII—Akai Pro’s flagship Ableton controller—into a compact design that fits in your backpack. APC mini comes pre-mapped to Live for an instant performance and production setup. When APC mini is plugged into your computer, its hardware controls correspond 1-to-1 with Ableton Live’s interface—no additional configuring is required. The result is a dynamic instrument that empowers you to make music with Ableton Live—anywhere. The APC mini includes Ableton Live Lite, AIR Instruments Hybrid 3, and Toolroom Artist Launch Packs. Once you have registered the product in your Akai Pro User Account you will have download links for all titles. Visit akaipro.com/my-account/login to create, and log in to your user account. The APC mini is supported and requires Ableton Live 9.1.3 or later for correct operation. The included Ableton Live Lite 9 Akai Edition is supported and functions as expected. The APC mini can be manually MIDI mapped for use with earlier versions of Ableton Live. Since the APC mini is class compliant, and does not require a driver, it is immediately compatible with all current Windows, and Mac operating systems. When the SHIFT button is engaged you can toggle the Fader Controls to adjust Volume, Pans, Sends, or Device Parameters. You can also toggle the lower button in the channel strip to control Clip Stop, Solo, Rec Arm, Mute, or Select. To do this hold SHIFT, and press the corresponding Scene Launch button.